Dixie was an amazing client. She had a great energy about her and she seemed like a kid in a candy store when I met with her. I knew then she and I would get along great! 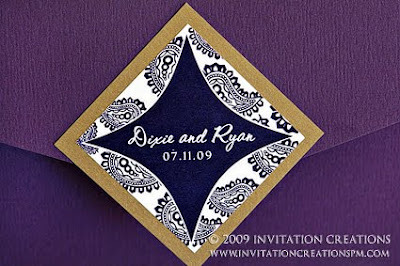 She and her husband-to-be had met or were fans of Furman University so she mentioned she wanted a specific symbol that she would show me of Furman incorporated somewhere in the invitation. 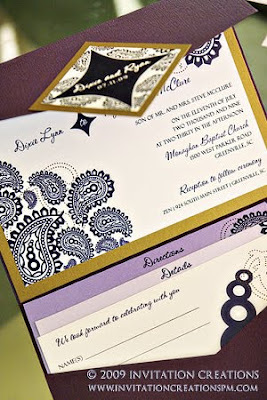 She also mentioned she wanted a paisley design on her custom invitations. This was great! She knew exactly what she wanted and she had the wording she wanted me to use for all pieces of the announcement on a flash drive. Though I had never created a paisley design before, I love the challenge each new project brings me. Her colors were purple and gold. Both of them were super clients and I have to say, both of you are lucky to have found each other!